Fairness: Act with fairness and integrity at all times. Innovation: Pursue creativity with enterprise and initiative. Harmony: Give and earn the respect of others through cooperation. Our Management Philosophy clearly expresses our views on sustainability. To us, sustainability means proactively engaging in environmental and social issues and challenges, delivering solutions through innovation, and living by the Management Philosophy. Corporate value is composed of financial and non-financial value; non-financial value in particular is steadily growing in importance. With regard to sustainability, such issues as climate change, the depletion of forestry resources and human rights issues pose grave threats to social and environmental sustainability. Adopting and implementing clear medium- and long-term corporate policies regarding these issues is directly related to increasing non-financial value and corporate value. Until now, to increase corporate value, each of our businesses has generally created its own innovative business model in anticipation of the challenges facing society. From now on, however, we will further fortify our traditionally strong businesses (vertical evolution) and also leverage internal and external expertise in order to generate better results than would otherwise be possible (horizontal expansion). This is the concept of our Global crossvalue platform; it will provide solutions for social and environmental problems and guide us in working toward a better tomorrow by providing a framework for promoting social and economic development and conserving the global environment. In December 2012 Marubeni declared its support for the UN Global Compact. The compact was proposed in 1999 by then UN Secretary-General Kofi Annan, and formally launched in the following year. Participating corporations seek to support and practice 10 principles relating to the areas of human rights, labor, environment, and anti-corruption. Marubeni is working to realize the ideals of the UN Global Compact by supporting these 10 principles. Click here to view the UN Global Compact web site. Principle 2:make sure that they are not complicit in human rights abuses. Principle 6:the elimination of discrimination in respect of employment and occupation. Principle 9:encourage the development and diffusion of environmentally friendly technologies. Principle 10:Businesses should work against corruption in all its forms, including extortion and bribery. Marubeni Corporation engages in activities as a Corporate Member of the Global Compact Network Japan (GCNJ), the local network of United Nations Global Compact in Japan. Working Groups, which are organized by theme, are held mainly by the network members of Global Compact Network Japan (GCNJ). Marubeni takes part in the following Working Groups. SDGs are shared goals of the international community, with the aim of achieving sustainable development socially, economically and environmentally. In 2015 the UN adopted an agenda of 17 goals, with 169 targets to be achieved by 2030. 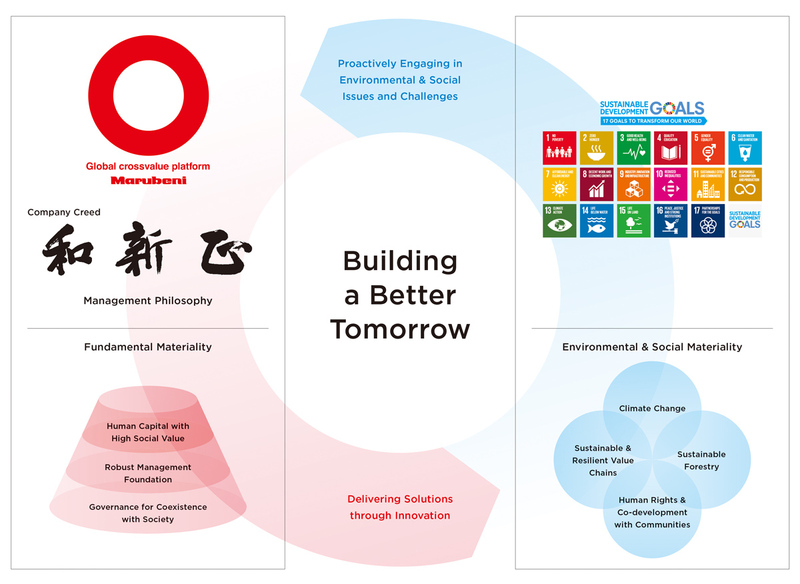 The Marubeni Group refers to these to evaluate the status of the social problem-solving activities from a mid-to long-term perspective, including disclosing the connections between the Action Plans and Targets of the various business groups and the SDG targets. The Marubeni Group has identified three categories of Fundamental Materiality for living by our Management Philosophy, building a better tomorrow, and accomplishing the goal of ensuring sustainable growth for the company. We regard human resources as our most valuable asset in meeting environmental and social demand, and proactively providing solutions. We define “Human Capital with High Social Value” as individuals who are essential not only to the company but also to society. We will nurture human capital with High Social Value, and thereby bring about innovation and provide solutions. Individuals who observe laws and act in conformity with accepted international customs, and who also maintain high ethical standards for the good of society. Innovative individuals with the foresight, insight and creativity needed to anticipate social change. Individuals with sound judgment and the ability to make correct decisions and act quickly. Individuals with the communication skills to truly address the demands of society, with a sense of purpose and responsibility, while also being attuned to the realities of the marketplace. These attributes are the foundation of decision-making, decisiveness and the ability to execute. We have identified Robust Management Foundation as the second category of Fundamental Materiality, as we believe it is necessary both for maximizing the potential of our human capital and for maximizing corporate value. We must build a foundation that facilitates the activities of our human capital and establish a truly Robust Management Foundation. If we cannot accomplish this, our human capital will not be able to continue innovating and providing solutions. Enabling our human resources to use our management foundation to the fullest will ultimately lead to maximizing corporate value. A fundamentally sound management foundation with a strong brand presence, reputation, sales foundation and network, and financial footing. A corporate climate and culture that is capable of producing abundant Human Capital with High Social Value, and can enable that human capital to engage in meaningful work. An environment that places importance on the ability to create diverse values and generate quality solutions within a diverse and inclusive organization. We will endeavor to increase corporate value based on a Robust Management Foundation in which Human Capital with High Social Value develops innovative ideas and continues providing solutions. Within that framework, and given social expectations and demands, we believe that strengthening our corporate governance system for improved coexistence with society is important to all of our stakeholders. We will deepen our engagement with diverse stakeholders, enhance the effectiveness of the Board of Directors’ oversight function, and bring greater transparency to our management in order to build a governance framework that allows for improved coexistence with society and works toward achieving sustainability. The Sustainable Development Goals (SGDs) adopted by the United Nations in September 2015 are goals for achieving sustainability and leaving the world a better place for future generations shared by governments, the private sector and civil society. In recognition of this, the Marubeni Group has identified the following categories of Environmental and Social Materiality in which it can truly make a valuable contribution. In addition to the 17 goals and 169 targets of the SDGs, and taking into consideration stakeholders’ expectations and interests as well as the environmental and social impact of our business, our categories of Environmental and Social Materiality are based on the criteria described below. Building on initiatives set out through our Fundamental Materiality, we will contribute to achieving the SDGs and work toward building a better tomorrow. We believe that the material issues for sustainability must be constantly reviewed as the society and environment surrounding the company continue to change. Specifically, we perform regular reviews through dialogs with stakeholders and checks of the expectations from society, as well as constantly analyzing the impact on the company. Climate change, which is responsible for phenomena such as global warming, changes in the natural environment and more frequent natural disasters, is a global issue with a broad impact on social and environmental sustainability. Marubeni has business operations throughout the world, and views climate change as a serious risk. However, we also believe that it presents business opportunities. The Marubeni Group has 12GW net power generation capacity (as of December 31, 2018) and is a leading independent electric power operator. We announced our “Policy on Coal-Fired Power Generation and Renewable Energy Generation Businesses” on September 18, 2018 as part of our proactive climate change countermeasures. ・We view climate change-related transfer risk as a business opportunity, and we aim to increase our “Green Revenue” of 700 billion yen in FY2017 to 1.3 trillion yen by 2023. Green revenue, a part of our business contribution to climate change countermeasures, includes the following. Sales of products certified as contributing to sustainable forestry, fisheries, etc. ・The Marubeni Group recognizes the importance of climate-related financial disclosures. As new measures to counter climate change, in addition to affirming the recommendations of the TCFD＊, we will endeavor to better understand the financial impact of both the risks and opportunities brought about by climate change, and also engage in improved climate-related financial disclosure. TCFD (Task Force on Climate-related Financial Disclosures): Established by the Financial Stability Board (FSB). Forests are a precious resource and enrich life on Earth in many ways. The Marubeni Group currently holds 140,000 hectares of tree plantations across the world (total gross project area is 320,000 hectares). These forests are run according to management methods for sustainable forestry. To build a better tomorrow, we have adopted a Forest Management Policy and a Procurement Policy (for Wood-derived Products) to conserve and sustainably use valuable forest resources. By operating our businesses in accordance with these policies, we will promote sustainable forest management and contribute to forest conservation. Due to the globalization of economic activity, serious abuses of human rights against workers and local residents are taking place in relevant countries and regions. Many of these abuses can be remedied or improved by taking human rights into consideration in business activities, and there are growing expectations that businesses should play a role in remedying human rights abuses. The Marubeni Group does business in 131 locations*1 in 66 countries and regions and employs 40,000 people*2 of many different nationalities and ethnicities. We are active in a wide range of businesses and conduct global, multi-faceted activities. The Marubeni Group deals with thousands of suppliers* in conducting transactions and operating a wide range of businesses on a global scale. We believe that we make important contributions to sustainability through environmental conservation and sustainable social development initiatives throughout our supply chain. To build a better tomorrow, we have identified Sustainable and Resilient Value Chains and working together with our business partners as an essential category of Environmental and Social Materiality. In addition to managing the supply chain, we will also involve buyers of our products and enhance the strength and competitiveness of our entire value chain, which includes not only the Marubeni group but also our business partners. As part of our sustainability initiatives, together with stakeholders, we, including our business partners, adopted our Basic Supply Chain CSR Policy in 2008 to manage our supply chain. Subsequently, to advance understanding of and cooperation with the spirit of this Policy, we sent the Policy to suppliers, conducted surveys, and dispatched personnel to suppliers’ manufacturing or production sites to conduct direct on-site inspections. Since we believe that value chain management is important, we will continue taking initiatives toward both suppliers and buyers of our products to resolve issues in this area. In addition, we have revised our Basic Supply Chain CSR Policy, adopting a new Basic Supply Chain Sustainability Policy to place more importance on climate change countermeasures and respect for human rights. As part of its organization to promote sustainability initiatives, the Marubeni Group has a Sustainability Management Committee under the supervision of the President. The Committee discusses policies and measures concerning our sustainability initiatives and ESG risk management and reports to the Board of Directors at least once a year. To incorporate the views of external parties, the Committee also includes External Directors and External Audit & Supervisory Board Members in an advisory role. 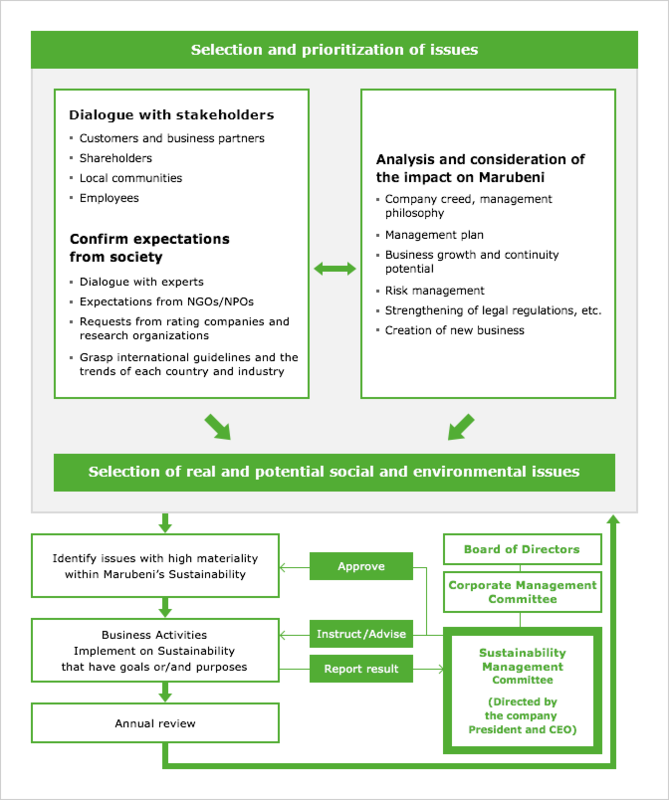 A director heads the Sustainability Management Committee, and the Board of Directors, by receiving periodic reports on important issues pertaining to the sustainability initiatives discussed by the Committee, oversees sustainability-related issues evaluated from the viewpoints of the appropriateness of our ESG risk management and compatibility with society. A Chief Sustainable Development Officer serves as the head of the Sustainability Management Committee. A Sustainability Management Department is newly established within the Corporate Staff (CS) Group to coordinate sustainability management among the Sales Division, the CS Group, and our branches, offices and local subsidiaries. 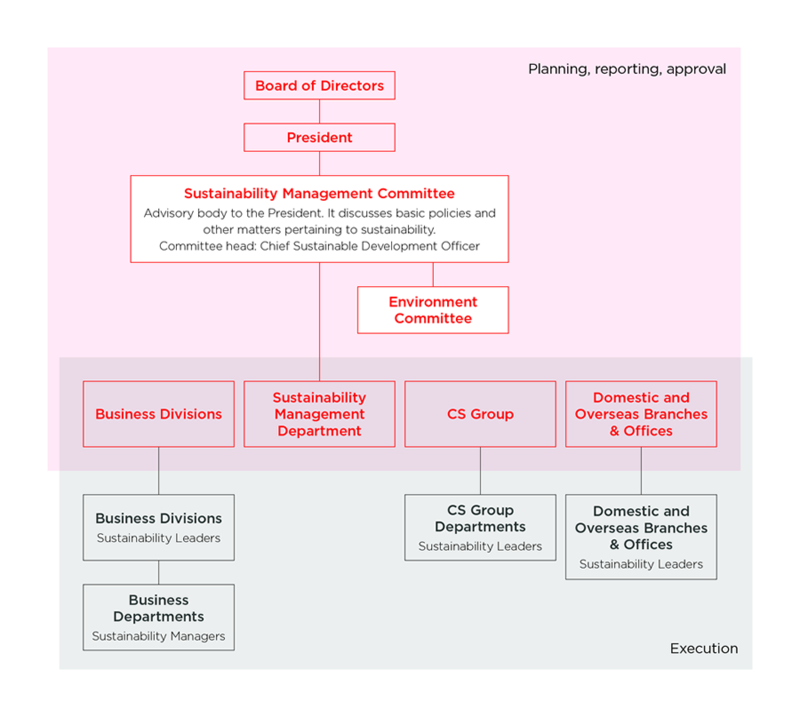 A Sustainability Leader in charge of sustainability management is appointed in each business division, each department within the CS Group, and at each branch, office and overseas corporate subsidiary. A Sustainability Manager is also appointed in each business department.